Conductor Robert J. Ambrose enjoys a highly successful and diverse career as a dynamic and engaging musician. His musical interests cross many genres and can be seen in the wide range of professional activities he pursues. Ambrose studied formally at Boston College, Boston University, and Northwestern University, where he received the Doctor of Musical Arts degree in conducting. Ambrose has conducted professionally across the United States as well as in Australia, Canada, Finland, Germany, Greece, Hong Kong, Singapore, and Taiwan. His interpretations have earned the enthusiastic praise of many leading composers including Pulitzer Prize winners Leslie Bassett, Michael Colgrass, and John Harbison. He has conducted over two dozen premiere performances including works by Michael Colgrass, Jonathan Newman, Joel Puckett, Christopher Theofanidis, and Joseph Turrin. In addition, a recent performance of Igor Stravinsky's Symphony of Psalms under his direction has been given repeated airings on Georgia Public Radio. 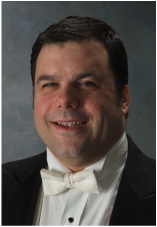 Dr. Ambrose is founder and music director of the Atlanta Chamber Winds a professional dectet specializing in the promotion of music by emerging composers as well as lesser-known works of established composers. Their premiere compact disc, Music from Paris was released in 2009 on the Albany Records label and has received outstanding reviews in both Fanfare Magazine and Gramophone Magazine. As a guitarist Ambrose has performed in dozens of jazz ensembles, combos, rock bands and pit orchestras. His rock band "Hoochie Suit," formed with members of the Chicago Symphony Orchestra, received rave reviews throughout the Chicago area. Ambrose currently serves as Director of Bands, Professor of Music and Associate Director of the School of Music at Georgia State University, a research institution of over 50,000 students located in Atlanta, Georgia. As Director of Bands he conducts the Symphonic Wind Ensemble, maintains a highly selective studio of graduate students in the Master of Music in Wind Band Conducting degree program, and oversees a large, comprehensive band program comprised of four concert ensembles and three athletic band organizations. He lives in Peachtree City, Georgia with his wife Sarah Kruser Ambrose, a professional flute player and daughters Isabelle and Hannah. Sandra Dackow holds three degrees from the Eastman School of Music and currently serves as Music Director of the Hershey Symphony Orchestra in Pennsylvania, of the Hershey Symphony Festival Strings, and of the William Paterson University Symphony Orchestra in New Jersey. An Aspen Conducting fellow, she was awarded the Silver medal in the 2001 Vakhtang Jordania/New Millennium Conducting Competition in Ukraine. Dr. Dackow has published over 100 works for student orchestras and is an author of Alfred’s Orchestra Expressions, Tempo Press’s Expressive Techniques for Orchestra, and a co-author of the MENC (NAfME) Complete String Guide. She has appeared as a guest conductor, clinician and adjudicator throughout the US and abroad, including summers at Interlochen, and other music camps. Sandra Dackow is a former President of the Conductor’ Guild, an international organization serving conductors in 31 countries. In 2009 she was elected a Lowell Mason Fellow by MENC: The Association for Music Education, as well as awarded the Bruno Walter Best Conductor Prize by the Master Academy International Competition in Switzerland. Dr. Dackow served as an orchestra and band director in the public school districts of Glen Rock and East Brunswick, NJ, as well as Supervisor of Music for the Ridgewood NJ schools. She is a former orchestra director at Slippery Rock University, PA, and orchestra and wind ensemble director at Brandeis University, MA. Primarily a violinist and violist, she has performed with various professional orchestras in New Jersey, Pennsylvania and Ohio, as well as trombone with the Hershey Symphony Big Band. Dr. William C. Powell, Professor of Music and Director of Choral Activities, holds degrees from Alabama State University (B.M.E. ), Westminster Choir College (M.M.E. ), and Florida State University (Ph.D.). Prior to his arrival at Auburn University in 2001 as assistant director of choral activities, he was director of choral activities at Philander Smith College in Little Rock, Arkansas, 1993-2001. At Auburn, Powell conducts the Chamber, Concert, Gospel and Men's Choirs, and teaches choral-related undergraduate, graduate, and distance courses. Powell is in demand as a choral conductor. In 2013, he served as a conductor and workshop clinician for the Melbourne International Singers Festival in Melbourne, Australia. And in 2014, the Auburn University Choirs presented in the New York premier of The Cry of Jeremiah by Rosephanye Powell (who will also serve as composer in residence and narrator) with William Powell as guest conductor. Powell has guest conducted at national landmarks such as Carnegie Hall, Walt Disney World, the Crystal Cathedral, Kennedy Center, Washington National Cathedral, and others. He was a regular guest conductor for the annual Candlelight Processional at Walt Disney World in Orlando, Florida. In June 2011, Powell served as a guest conductor during a performance tour of Verdi's Requiem in Italy which involved selected members of the Auburn University choirs and singers from around the U.S. and other parts of the world. Additionally, Powell has guest conducted for all-state choruses and several other choral festivals and clinics around the country. As an adjudicator, Powell has judged for choral festivals at the district, regional, state, and national levels. A frequent conference presenter, Powell has given lectures at state, regional, national, and international meetings of organizations such as affiliates of the National Association for Music Education, American Choral Directors Association, Intercollegiate Men's Choruses, College Music Society, Hawaii International Conference on Arts and Humanities, and the National Society of Music in Technology. Powell is a noted arranger and accompanist. His choral arrangements are published by Hal Leonard Corporation and Gentry Publications. He and his wife, Rosephanye Powell, are co-editors of the recent Oxford University Press publication, Spirituals for Upper Voices. Also in collaboration with his wife, he has provided piano accompaniment for various performances as guest artists at a number institutions throughout the United States. An active member of the American Choral Directors Association, Powell has served as the Repertoire and Standards Chair of the Committee on Ethnic and Multicultural Perspectives for the both the southwestern and southern divisions. He also holds memberships with the National Association for Music Education (NAfME, formerly MENC), and the American Society of Composers and Publishers (ASCAP). He and his wife, Rosephanye, have two daughters: Camille and Kaitlyn. After earning his Bachelors and Masters degrees from the University of Illinois, he became the Low Brass Instructor at the Interlochen Arts Academy in Michigan. During his 16 years at Interlochen he founded the Jazz Studies programs at the Academy and at the National Music Camp. He led the Dave Sporny Big Band and the Interlochen Jazz Quintet while being an active performer throughout the Midwest. Since coming to the University in 1982, he has been a frequent recitalist, clinician and freelance trombonist in New England. Being equally comfortable in both classical and jazz traditions, Mr. Sporny has appeared in concert halls throughout the world including Carnegie Hall, Lincoln Center, Kennedy Center, Tanglewood and Ravinia. Tours with various ensembles have taken him to South America, Europe, Scandinavia, Eastern Europe, Japan and Russia. He has performed with the Chicago Little Symphony, the Northwood Orchestra, Opera North, the Springfield and Hartford Orchestras, Ancora Chamber Ensemble, and the Corporate Brass. In 1997 he was chosen as principal trombone for the Festival Orchestra of Santa Domingo in the Dominican Republic. Most recently, as a member of the Silk Road Ensemble, he performs with Yo Yo Ma. He has also performed with The Tonight Show Orchestra, Tommy and Jimmy Dorsey Orchestras, Les Elgart, Joe Williams, Frank Sinatra Jr., Nancy Wilson, Maureen McGovern, Aretha Franklin, Andy Williams, Dave Brubeck, Marian McPartland, Max Roach, Billy Taylor, Slide Hampton, J.J. Johnson, to name a few. Dave Sporny is the founder and musical director of the Amherst Jazz Orchestra. In 2004 the International Association for Jazz Education presented him with a Lifetime Achievement Award. David Sporny has recorded 12 albums and 17 CD's for RCA, Brownstone, Seabreeze, Jazz Masters and Original Cast Recordings. He is a voting member of the National Academy of Recording Arts and Sciences.